This would make a lovely wedding gift. 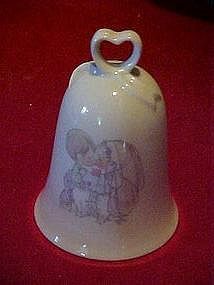 Porcelain bell has a Precious Moments theme with a little bride and groom kissing on one side, and the other side says "The Lord must have brought you together". Marked inside, Precious Moments Johnathan and David, and has the original Enesco foil sticker. Measures 4 1/4" tall, has the clapper and is in perfect condition.